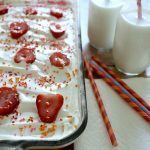 Love this Sweet, Light, and Luscious Strawberry Poke Cake – A simple to make cake using a cake mix. Comes out moist and delicious every time. A sure hit with family and friends. Bake one up soon, enjoy! 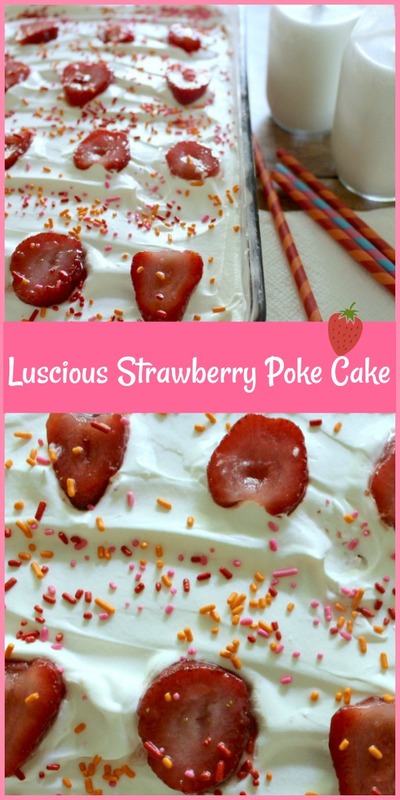 This delectable poke cake is a snap to make. It’s so pretty too and always a hit with family and friends. A great cake for birthdays since it’s so festive looking. This looks so nice on a dessert table for any occasion. Everyone seems to go for this dessert first. It’s light and just the right amount of sweetness. You’ll know what I mean once you taste a piece of this strawberry delight. Go ahead and bake one soon! 1 box strawberry jello, I used sugar free, plus water and ice cubes for preparation. Preheat oven to 325 degrees, spray a glass 13 X 9 cake pan with cooking spray, set aside. In a large mixing bowl, combine cake mix, dry pudding mix, egg whites, vanilla, water and oil. Use a hand mixer and whip until fluffy, about 1 to 2 minutes. Then with a rubber spatula, mix again to make sure all the dry ingredients are mixed thoroughly into batter. Pour batter into prepared pan and bake for about 22 to 30 minutes. Check after 22 minutes. When toothpick comes out clean or with dry crumbs, it’s done. Also cake should spring back when lightly touching the top. Cool on wire rack or place in fridge for a few minutes. Now, prepare the jello using the fast set option. Do this in a large glass measuring cup. When completely dissolved, set aside for a minute while you poke holes in cake using a large wooden skewer or the end of a wooden mixing spoon. I made lots of pokes. Pour the jello over the cake and see it soak in. Place cake back in fridge uncovered for 30 minutes then cover and let set up at least 2 hours. When all set, top with Cool Whip and sliced strawberries. Toss around some sprinkles and put back in fridge for about 20 more minutes. Slice up and enjoy the strawberry deliciousness! 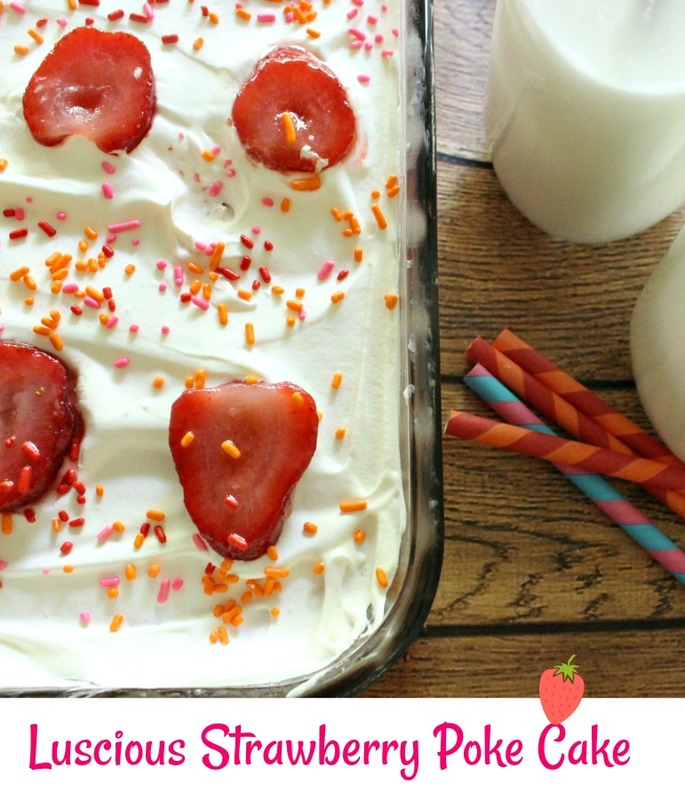 This luscious cake is simple to make using a cake mix and comes out moist and delicious every time. 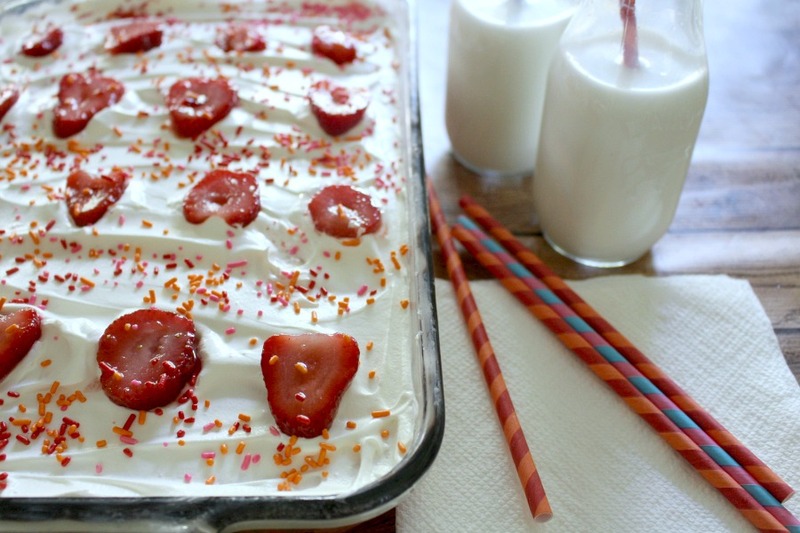 Enjoy the strawberry deliciousness! 1 small box strawberry jello, I used sugar free, plus water and ice cubes for preparation. 1.Preheat oven to 325 degrees, spray a glass 13 X 9 cake pan with cooking spray, set aside. 2.In a large mixing bowl, combine cake mix, dry pudding mix, egg whites, vanilla, water and oil. Use a hand mixer and whip until fluffy, about 1 to 2 minutes. Then with a rubber spatula, mix again to make sure all the dry ingredients are mixed thoroughly into batter. 3.Pour batter into prepared pan and bake for about 22 to 30 minutes. Check after 22 minutes. When toothpick comes out clean or with dry crumbs, it’s done. Also cake should spring back when lightly touching the top. 4.Cool on wire rack or place in fridge for a few minutes. 5.Now, prepare the jello using the fast set option. Do this in a large glass measuring cup. When completely dissolved, set aside for a minute while you poke holes in cake using a large wooden skewer or the end of a wooden mixing spoon. I made lots of pokes. 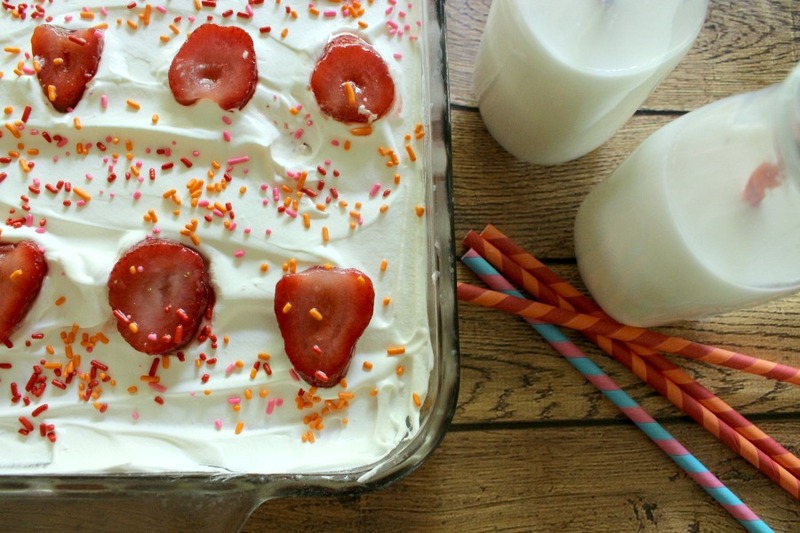 6.Pour the jello over the cake and see it soak in. Place cake back in fridge uncovered for 30 minutes then cover and let set up at least 2 hours. When all set, top with Cool Whip and sliced strawberries. Toss around some sprinkles and put back in fridge for about 20 more minutes. 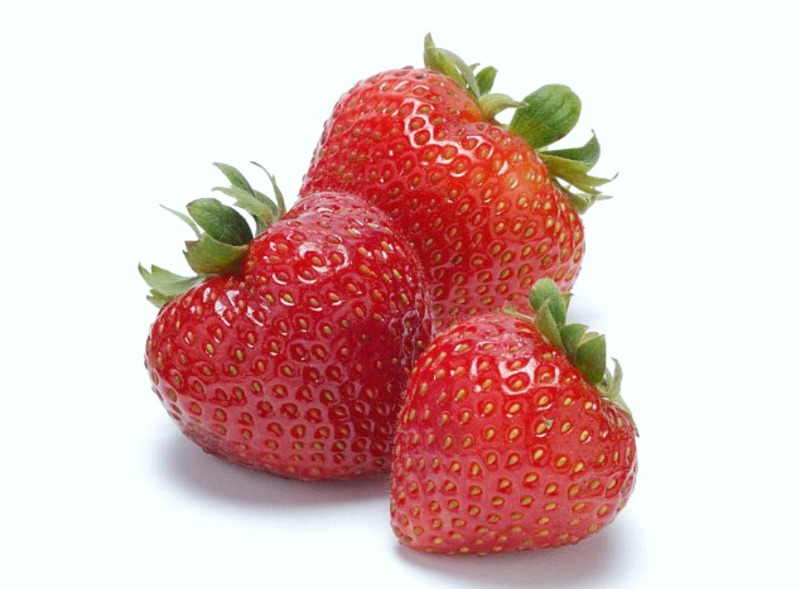 Enjoy the strawberry deliciousness!